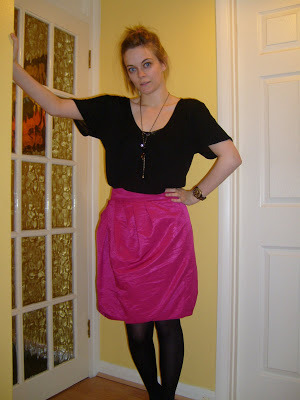 I also wore this skirt in a mini celebration that it’s a bank holiday weekend…wahoooooo. What’s everyone got planned??? Me, well Saturday I’m going shopping with the mothership to look for some shoes for a wedding outfit (expect this in another post as I need some serious advice…oh but it’s not my wedding) and I also need to stock up on tights from Primark. Sunday I’m off to my partner in crime, Chez’s, BBQ/Cocktail party, then Monday I’m going to have a relaxing day with the boyf hopefully….Hope you all have a good one. Next Post Green green grass…. M&S is where I stock up on tights, they last ages. From Primark they must be, what, like 10p? And I love the skirt. Great colour. That skirt is great, I love the colour, it suits you so well!